“Beast from the east” is the common British expression for the wintry air mass, that comes to Britain mainly from the east or north east. It happens when a big land-base high pressure system is coming to Eastern Europe and bringing arctic air mass from the north-west Russia (The White Sea or Ural Mountains) to Central and Western Europe. At the outcome nearly whole continent tends to experience a very low temperatures. 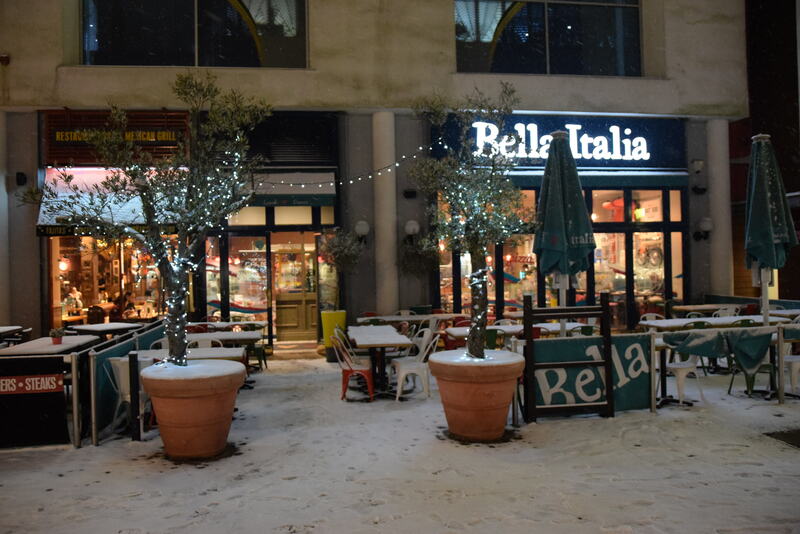 Snow and frost is possible even in the warmest european climes. 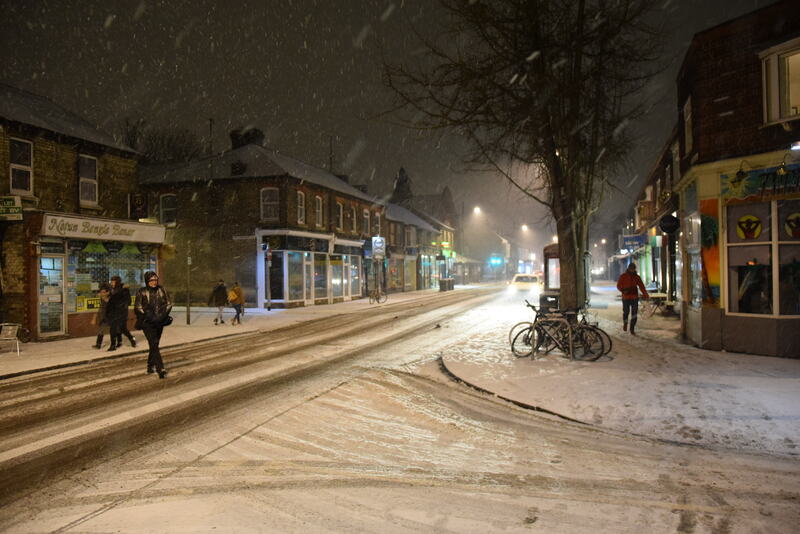 I would like to bring you more details about last British winter, that was the strongest since I started to live in this country. People told me about another one, that brought a stable snow acummulation during the 2012/2013 cold season. Many things are happen and many discussion is rising up due to global warming, that causes sewere weather around the Globe. 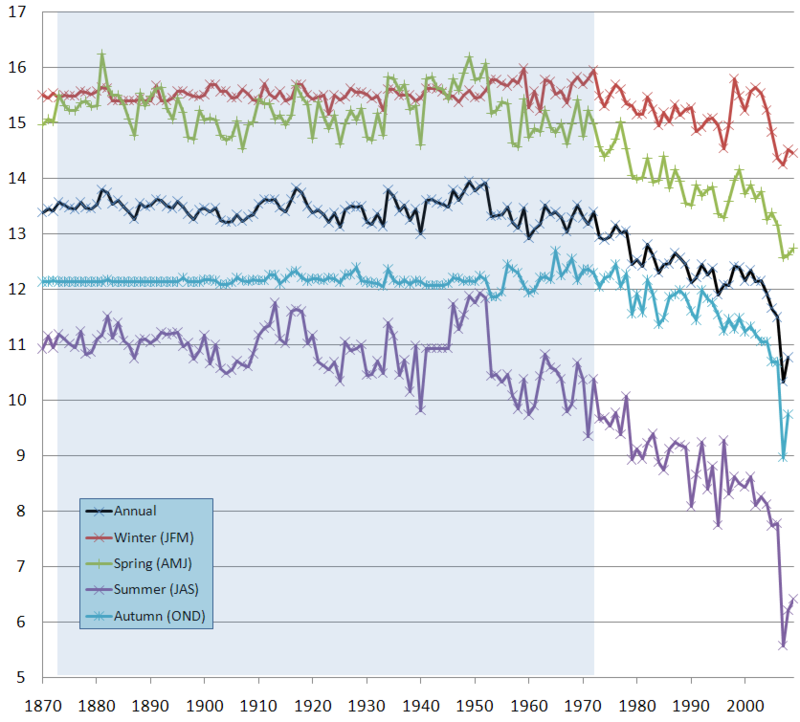 In our simply undertanding once climate is getting warmer, winters should tail off. Situation looks different. Winters are not extinct, but winters change. Is understandable in marine climates, that the coldes month in usually February instead of January on inland. However recent winter seasons have shown, that moment with the lowest temperature may occur in late February on the internal part of the continent and even mid-March near to the Atlantic. Everyone, who is by no means a meteorologist can notice it. Basic cause of unusual winters in Europe is climate change in the Arctic. As you learned from geography lessons the weathr in Arctic Ocean is driven by the Polar cell. The air rises to the tropopause near 60th parallel and next moves poleward. When the air reaches the polar areas, it has cooled and considerably denser than the underlying air. It descends creating a cold, dry high-pressure area. Next at the polar surface level the mass of air is driven toward the 60th parallel, replacing the air, that rose from there and completing the polar circulation cell at once. The outflow of air mass from the cells creates the Rossby waves (planetary waves), that are a giant meanders in high-altitude winds. Those winds have a major influence on the weather. The Planetary waves are associated with pressure systems and jet stream (Holton, James, 2004). The polar jet stream is determined by them. Pic. 1 Seasonal variation and long-term decreasing of Arctic Sea ice volume (wikimedia.org). – Cold blob – this is an phenomenon of cold temperature anomaly of ocean surface waters (Pic. 2). How this cold blob is produced? Pic. 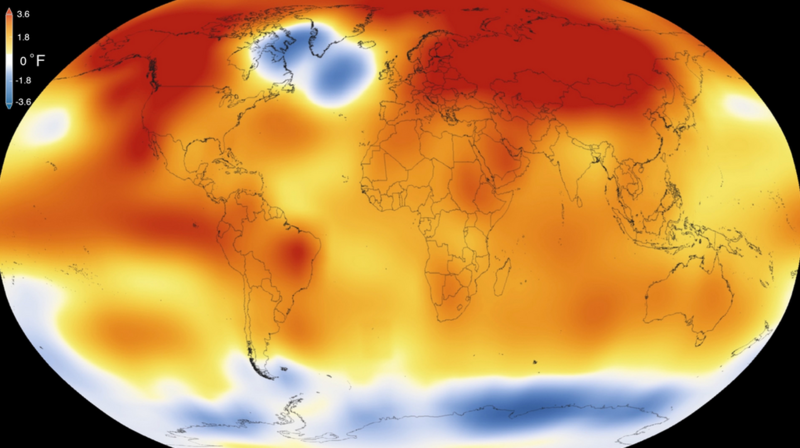 2 The cold blob phenomenon seen on NASA’s global mean temperature in 2015 – the warmest year since 1880. Blue color indicates the area with a cold temperature anomaly of North Atlantic surface (wikimedia.org). 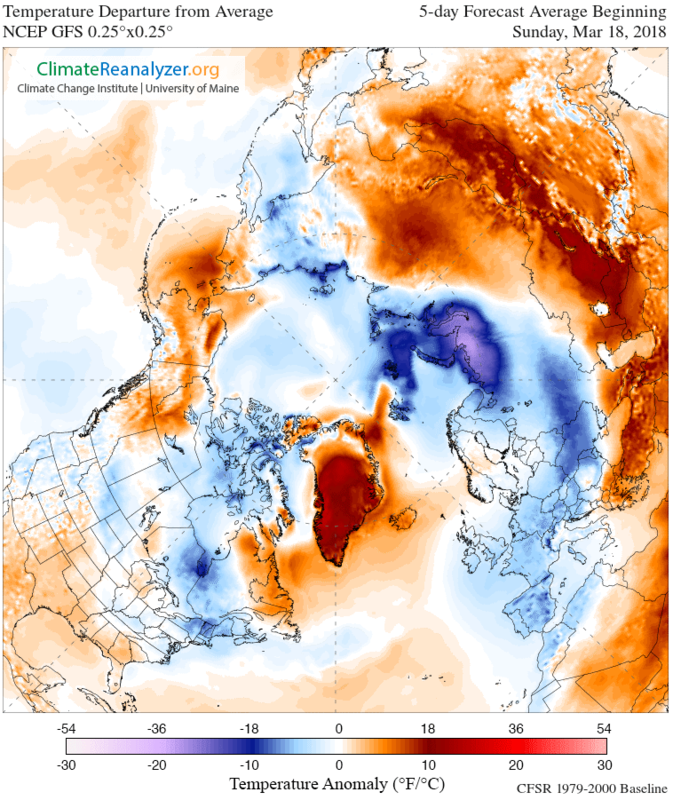 High temperatures cause melting down the Greenland ice sheet, that is possibly related with cold temperature anomalies observed in recent years in Europe and North America. The freshwater, that comes straight from melted ice sheet decreases the ocean water salinity. Due this process colder waters cannot sink. In the result the warmer water supported by Gulf Stream cannot reach the Arctic Ocean. This water becames colder than normal even in the halfway of the Gulf Stream around 50 – 60 latitude (Pic. 4). 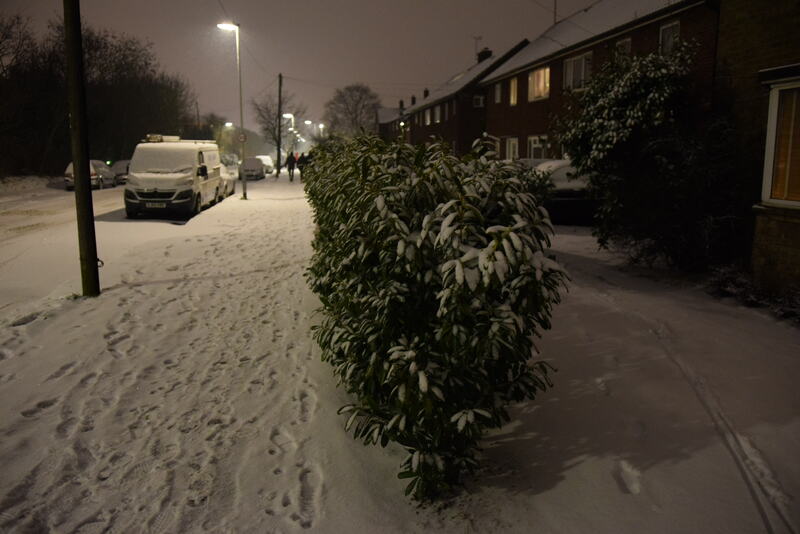 The 2015 example caused a lot of speculations about the further British winters (Pic. 3). Pic. 3 A detailed view of the cold blob in 2015 just west from the British Isles with over 1C deg colder temperature of Atlantic surface (meteomodel.pl). Pic. 4 The cold blob formation in the North Atlantic. Frest water from the Greenland ice sheet feeds up the Ocean water around 60 latitude. 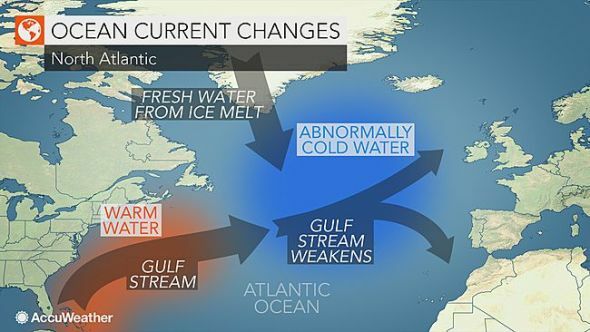 Subseqequently the Gulf Stream is getting weaker causing lower than normal temperature of water surface (accuweather.com). 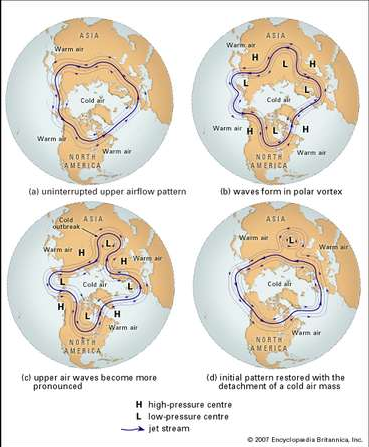 – Waviness of the polar jet stream – is caused by rising temperature in the polar areas, that destabilize the border between the Polar and Ferrel cells. The jet stream shoud blow consistently from west to east and keep the cold Arctic air locked in the polar region. Warming the Arctic reduce the termic contrast between Polar Cell and Ferrel Cell thereby destabilize the polar jet stream, that starting to meander (Pic. 5, 6). Pic. 5 The polar jet stream changes (Encyclopedia Britannica). 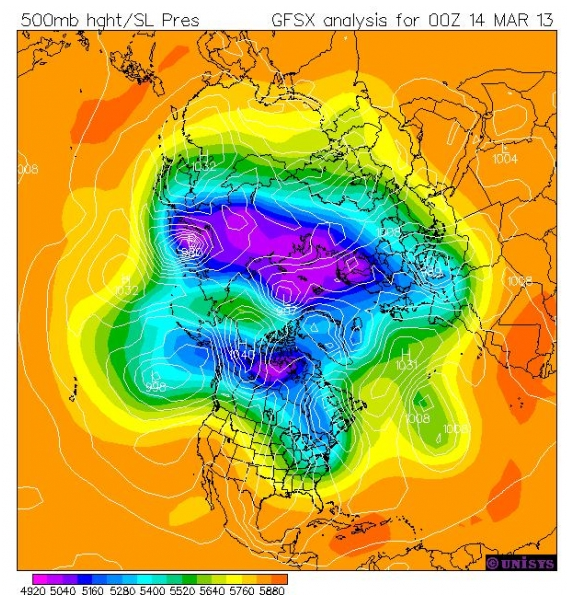 The best is pattern A, where strong polar jet stream keeps the cold arctic masses away from lower latitudes. Unfortunately we are the witneses of a weakening of this jet stream, that is becaming to look as a big meander (pattern C). Pic. 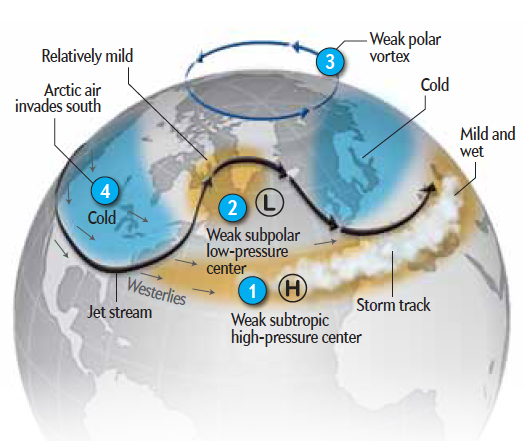 6 Actual shape of polar jet stream (jworldannapolis.com). The wobbling polar jet stream allowes to enter a warmer air masses poleward and colder air masses southward at once. In the result we may have much colder winters (or simply episodes) in Europe or North America with much milder winters in the Arctic even with higher temperature than inside cold mass outbreak in lower latitudes. Waviness and weakening a jet stream may also cause an extended periods of sewere weather like heat waves during the summer, dry spells, etc. Pic. 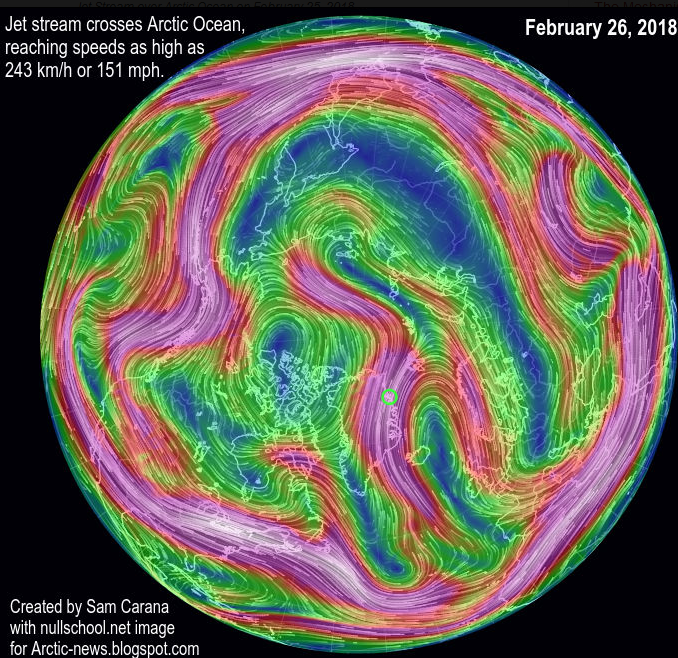 7 The jet stream crosses Arctic Ocean in 26.02.2018 (arctic-news.blogspot.com). Pic. 8 The “atmospheric river of heat” reaching the North Pole in 25.02.2018 (arctic-news.blogspot.co.uk). – The air mass circulation changes – The woblling polar jet stream can distrupt typical pressure systems, which will result the changes of the air mass circulation pushinga low pressure systems poleward and bringing the high pressure outside the Arctic (Pic. 9). Pic. 9 Low pressure system came very close to the north pole. 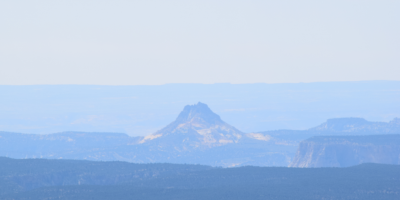 High pressure areas are visible in lower altitudes e.g. above Alaska. 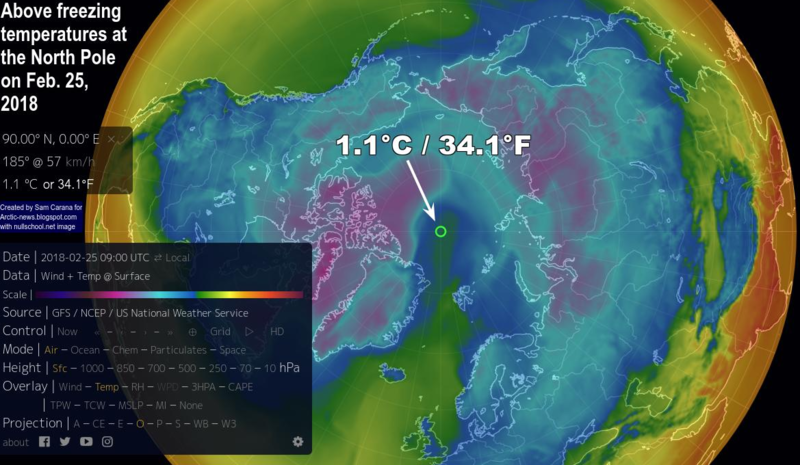 The Arctic warms twice as fast compared to different part of the world. When ice sheet dissapeared the albedo will drop down rapidly making the temperatures much higher. Moreover alongside with rising temperature the methane concentration is increasing. This greenhouse gas is one of the major contributor of global warming. Anyway knowing a basic mechanism of the polar cell and all aftermaths of the climate change in the Arctic we should be aware of the cold temperature anomaly, that may bring unforeseen cold increasing in warmer climate zones. Unusual situation for Britain according to my was a temperature below 0 Celsjus even throughout the day! 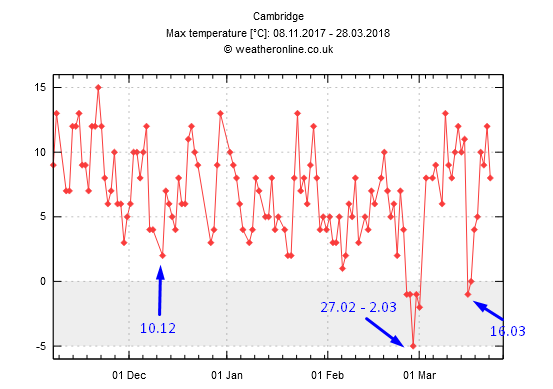 I live in Cambridge, where temperature from Tuesday Feb 27 till Friday March 2 was not higher than -1deg! Pic. 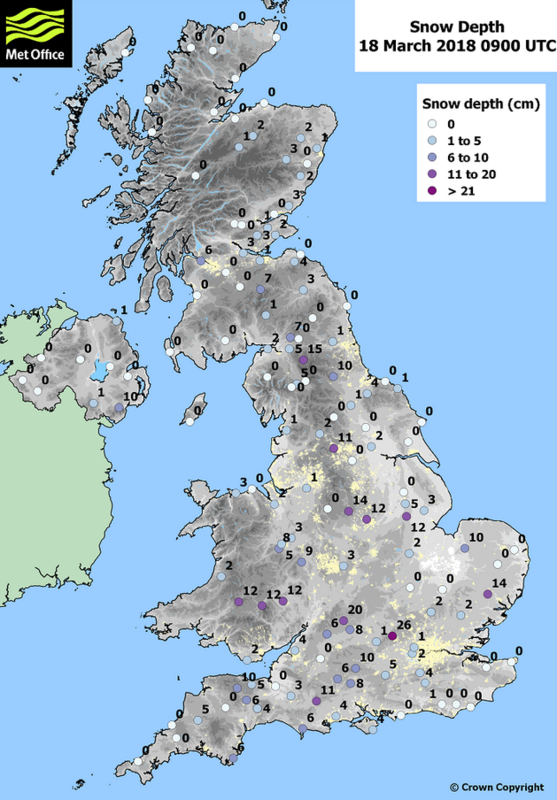 10, 11 The maximum temperature in UK on February 28 and March 1 (metoffice.gov.uk). 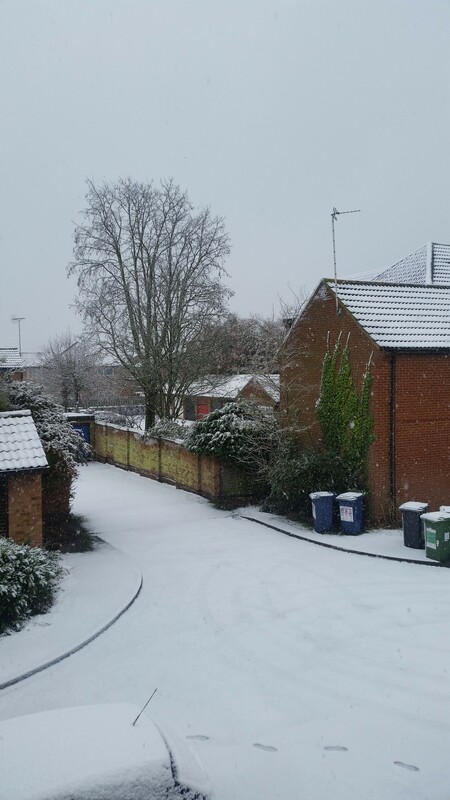 Typical “beast from the east” bringing to the UK not only a low temperatures, but also a lake-effect snowfalls. This kind of precipitation is produced when the cold air mass moves across long expanses of warmer lake or sea (Pic. 13, 14). 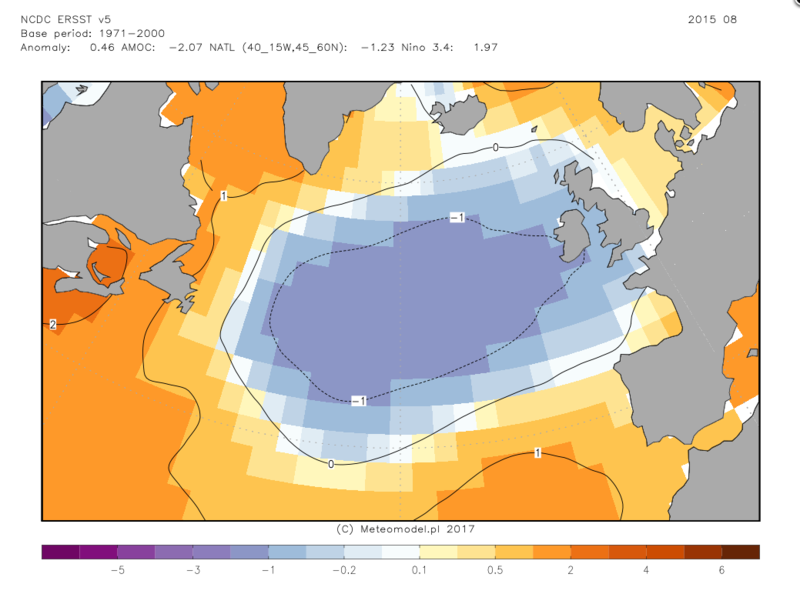 In case of Britain this is a North Sea with water surface temperature around 6-8deg during the coldest season. Those showfalls are the strongest when reaching coastline or a mountain ranges (Pic. 12). Pic. 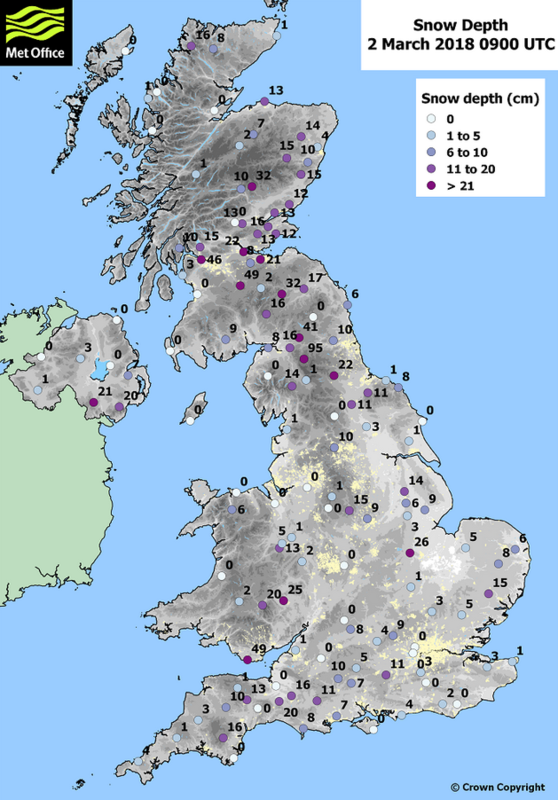 12 Snow depth across the UK on 2nd of March at 9am (metoffice.gov.uk). Pic. 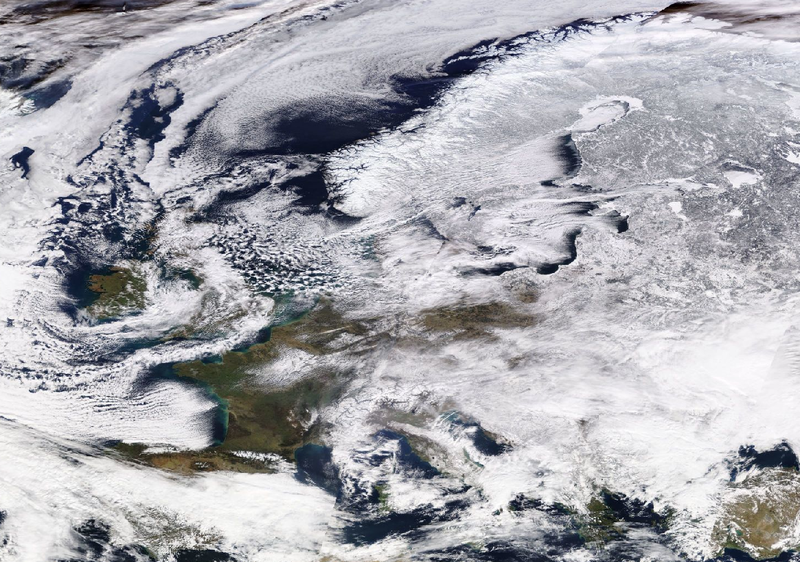 13 The lake-effect snowfalls captured above the Baltic and North Sea on 28th February 2018 (wikimedia.org). Pic. 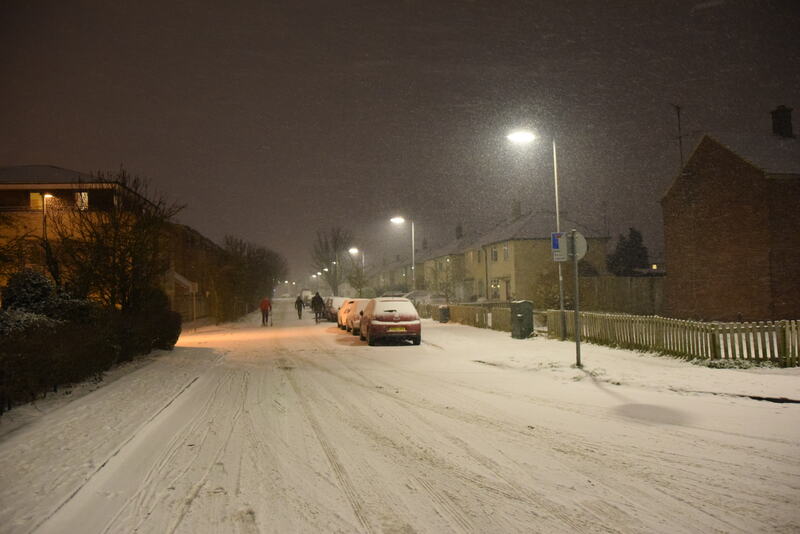 14 The lake-effect snowfalls above North Sea and Britain. 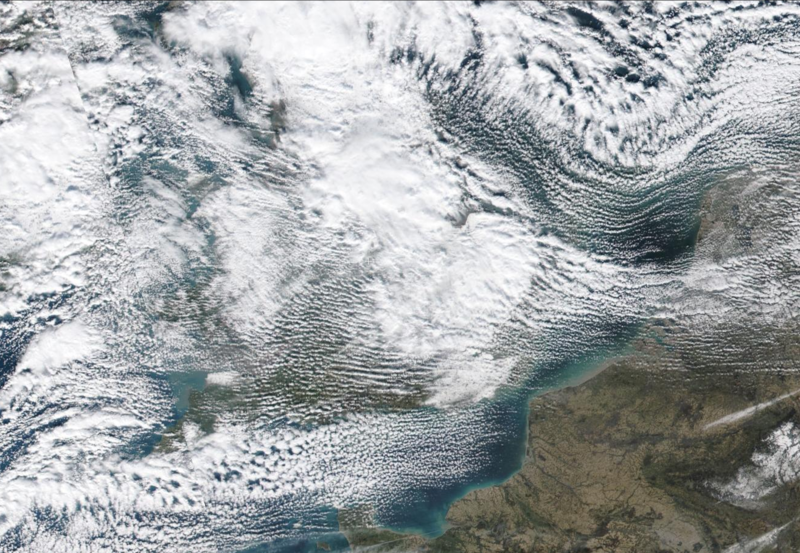 In the picture we can see a gradually developing stratocumulus clouds moving westwards (zoom.earth). 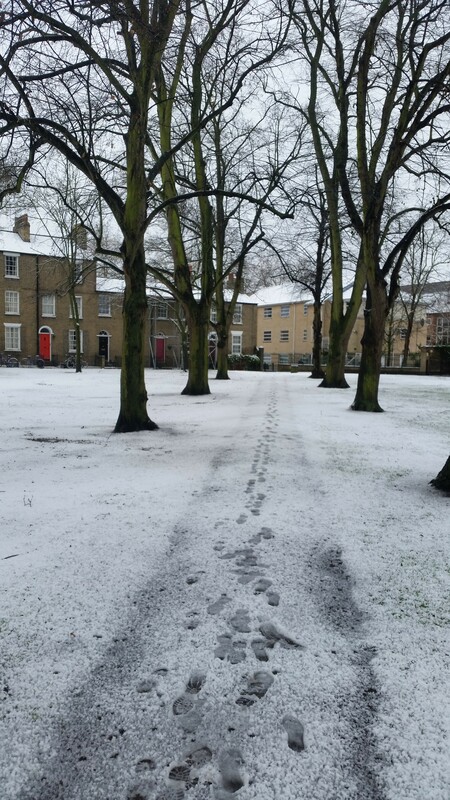 For this instance Cambridge (in general south east England except the shoreline) was located in the snow shadow, thereby the precipitation was not to big. 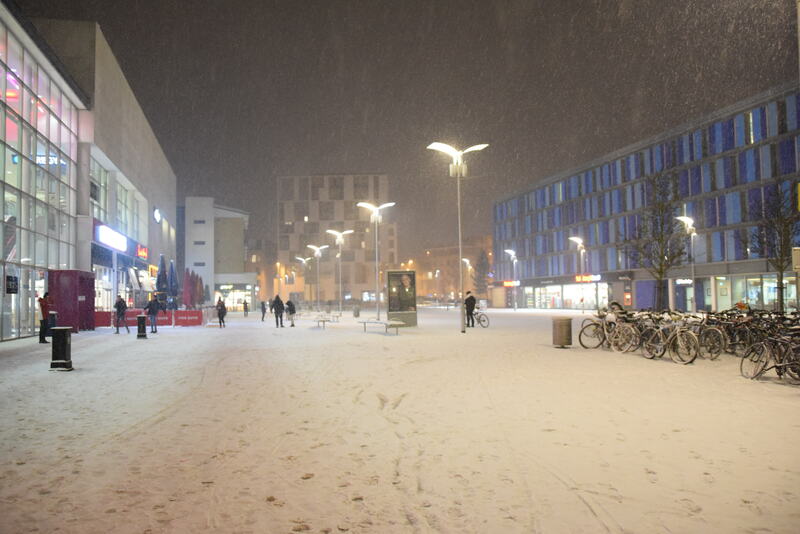 We could witness a short and intensive snowfalls with building acummulation (Pic. 15, 16). Pic. 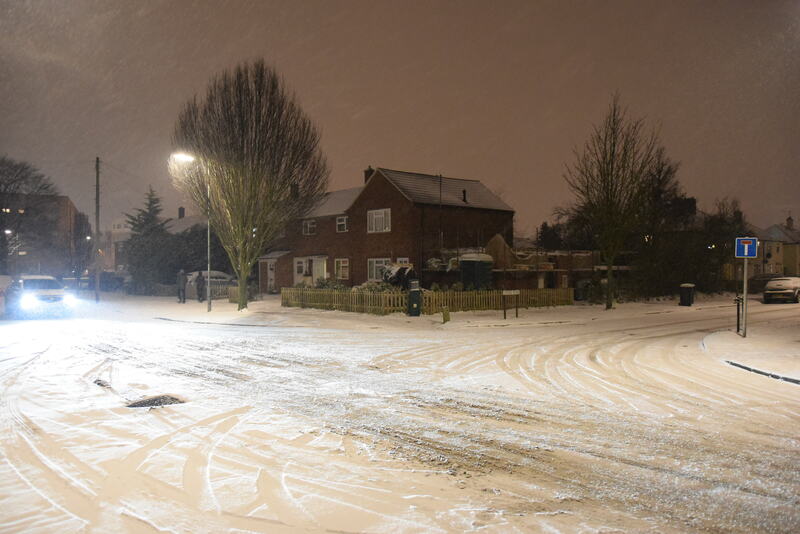 15 A thin snow layer in Longstanton (27th February). Pic. 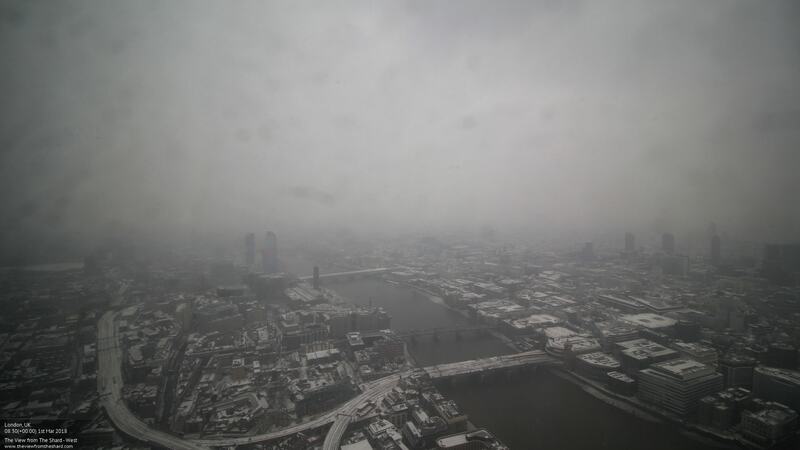 16 White London cityscape on 1st March at 8.45am (theviewfromtheshard.com). Pic. 17 Cambridge, Corrie Road, late afternoon on 28th February. 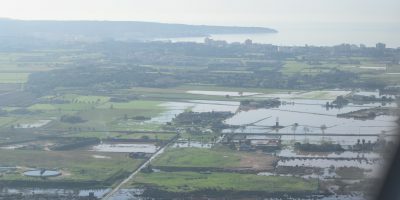 The situation started to chenge rapidly in Friday March 2 afternoon, when a warm front was inching from France. 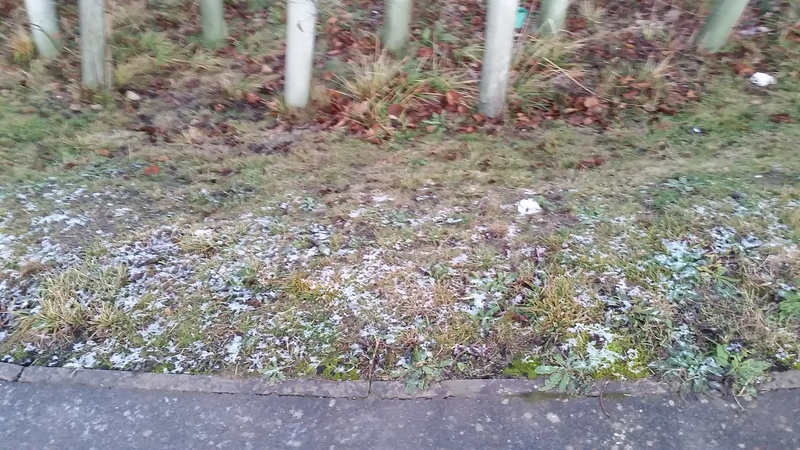 Big snowfalls followed by sleet and consequently rain were observed in south east UK corner first. 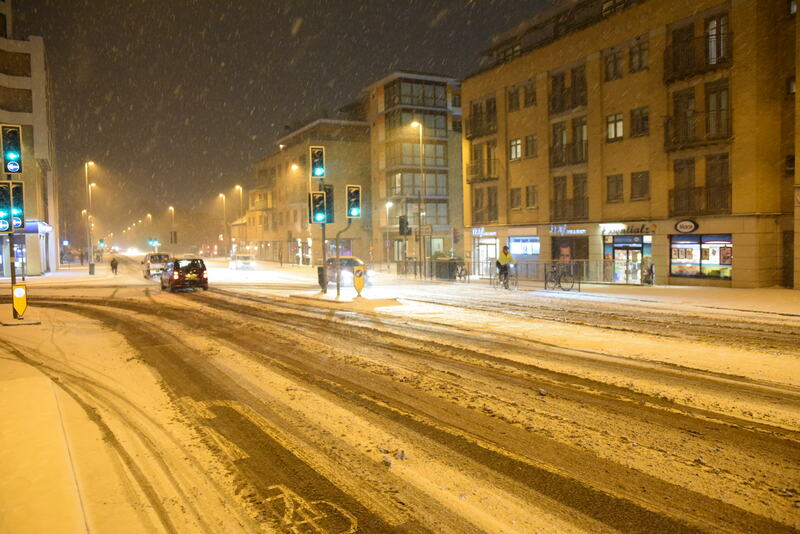 In Cambridge this day remained a really strong winter. Pic. 18 Cambridge, Mill Road with Sedgwick Street junction in Friday March 2nd evening. Pic. 19 Cambridge, Mill Road, 2.03.2018. Pic. 20 Cambridge, Argyle Street, 2.03.2018. Pic. 21 Cambridge, Rustat Road, 2.03.2018. Pic. 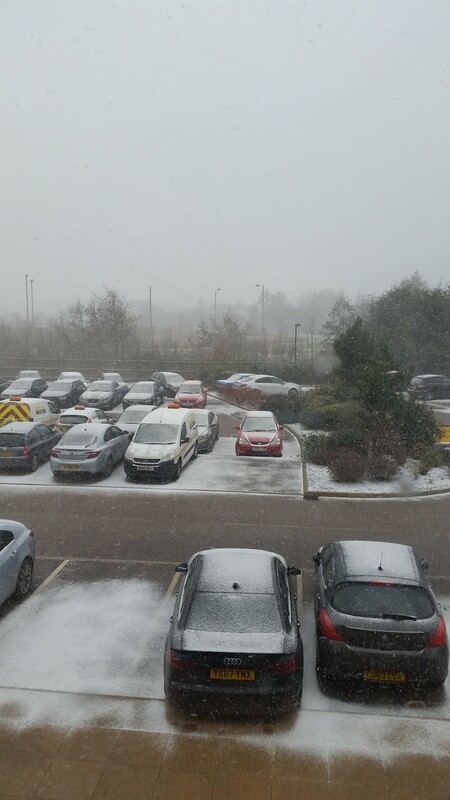 22 – 25 Winter in Cambridge Leisure Park, 2.03.2018. Pic. 26 Cambridge, the Hills Road and Cherry Hinton Road junction covered by snow, 2.03.2018. Pic. 27 The evergreens (Rhododendron) covered by snow, 2.03.2018. Pic. 28 Cambridge, the Davy Road and Corrie Road junction, 2.03.2018. After the night melt cames and snow sheet started do dissapear so quickly. Pic. 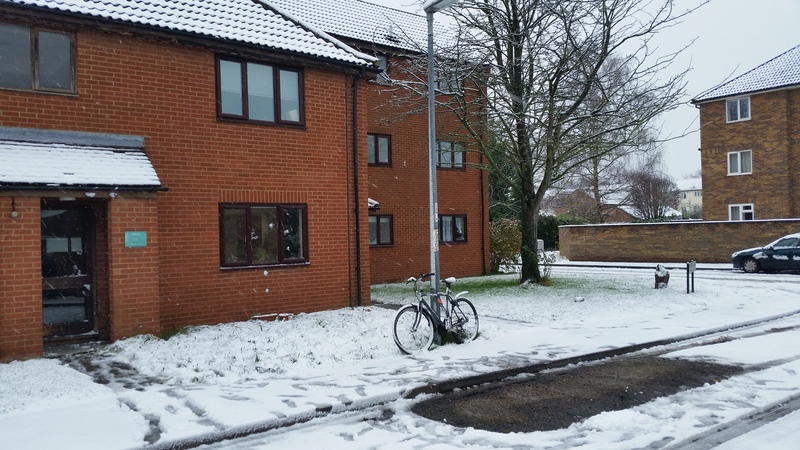 29 Melting snow near Cambridge train station, 3.03.2018. This period so-called “a first beast of the east” in the February & March winter period brought definitely the hardest winter episode (Pic. 30). Pic. 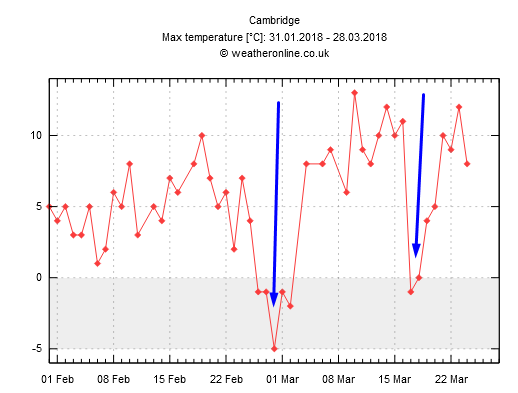 30 The temperature drops recorder in Cambridge during the February & March period (weatheronline.co.uk). Mild atlantic air mass came afterwards and temperatures rose up to 13 degrees. 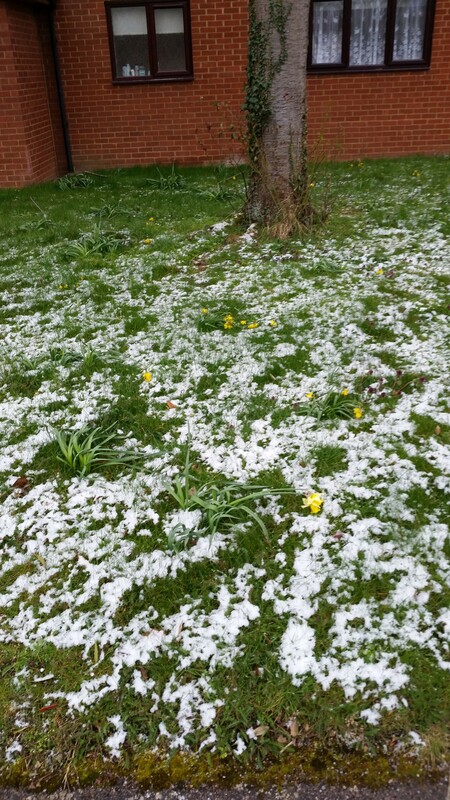 This spring looking weather did’t last long, because after around one and half week the UK area was stroke by “2nd beast from the east”, that was slightly weaker than previous one. 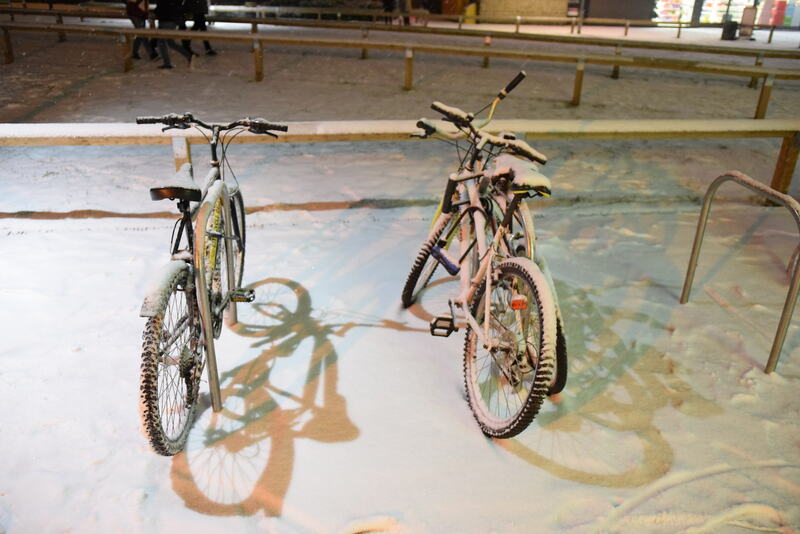 It brought a precipitation with snow setting, however the white sheet dissapeared after dozen or so hours. Unfortunately the spring progress had been stopped for nearly 3-4 days (Pic. 31 – 34). Pic. 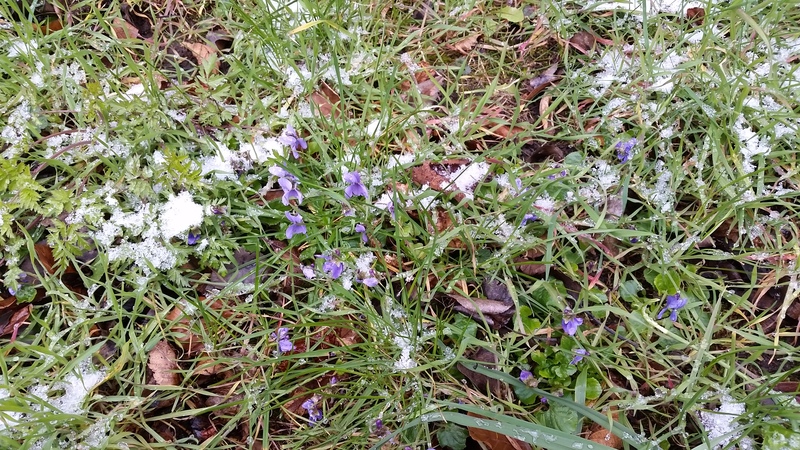 31, 32 Violets and daffodils hit by snow, Corrie Road, Cambridge, 17.03.2018. Pic. 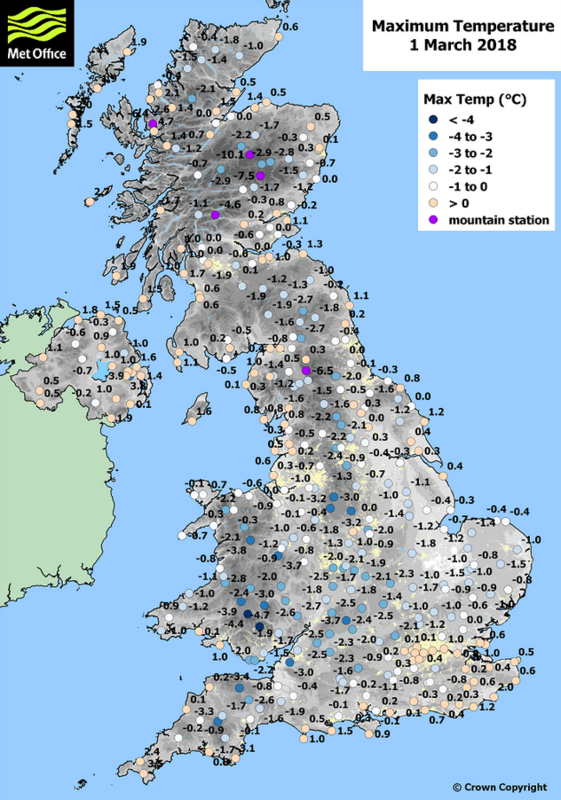 33 Snow depth in UK on 18th March 2018 (metoffice.gov.uk). Pic. 34 The temperature anomaly on the northern hemisphere, 18.03.2018 (cci-reanalyzer.org). The third “beast of the east” cames just before Easter. We are facing it now at the time of preparing this article. Today in Cambridge is heavy rain with small pieces of hail when temperature drop down to 4 degrees only. Yesterday was colder due to clear sky (Pic. 35). Pic. 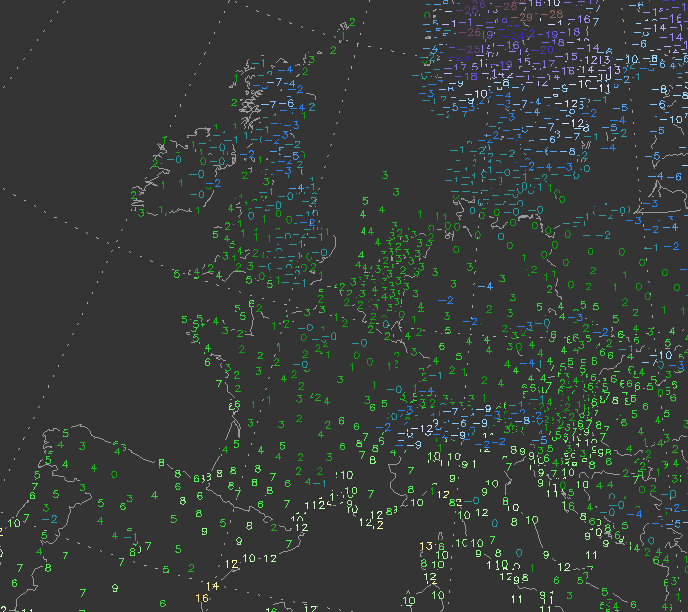 35 Temperature minimal recorded in western Europe on Friday 29th March morning (modellzentrale.de). Hopefully this is the last cold episode in Britain during this cold season. We will see. At the finish I would like to bring some information about last British winter in general. 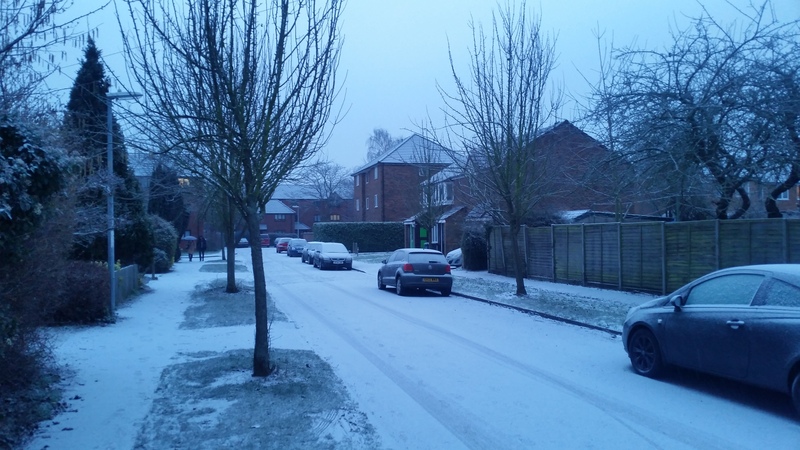 Media spoke a long time before this cold season, that winter in Britain “is going to be incredible”. Were they right? Possibly! 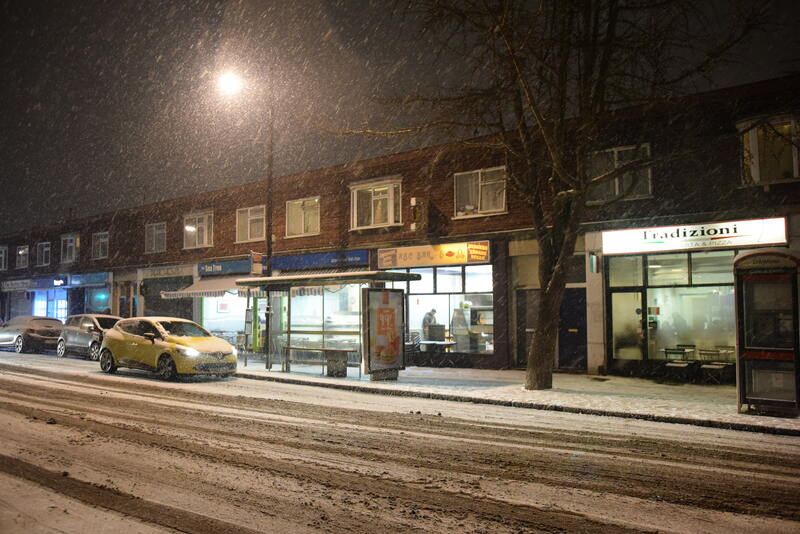 It was the hardest winter, that I have been witnessed in England. 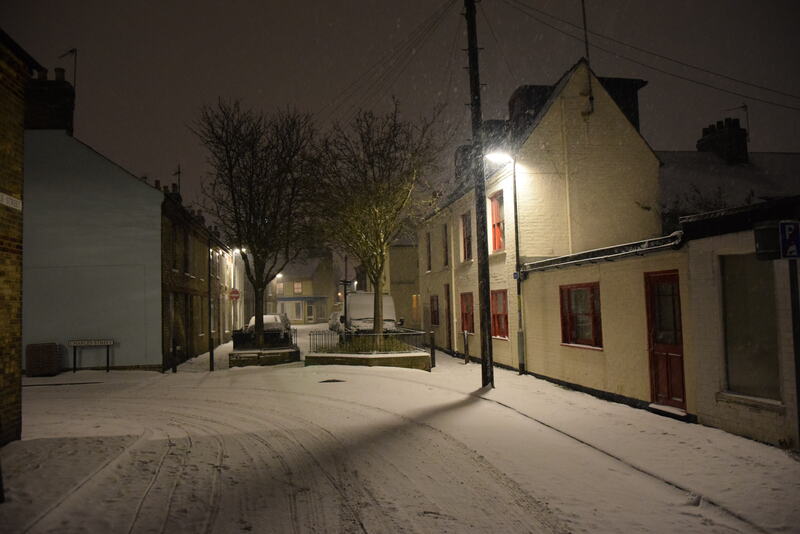 First snowfall in Cambridgeshire was recorded on 30th November (Pic. 36), but much bigger one with serious building accumulation could be seen 10 days later (Pic. 37 – 44). Pic. 36 Diagram showing the temperature variations during the whole 2017/18 winter season in Cambridge. We can see 3 major moments with considerable snowfalls: 9-10.12 overnight (max. precipitation between 1am and 6am), 27.02 – 2.03 (max. snow preciptation beweeen Fri 2nd 15pm and Sat 3rd 3am) and 16-17.03 overnight (max. 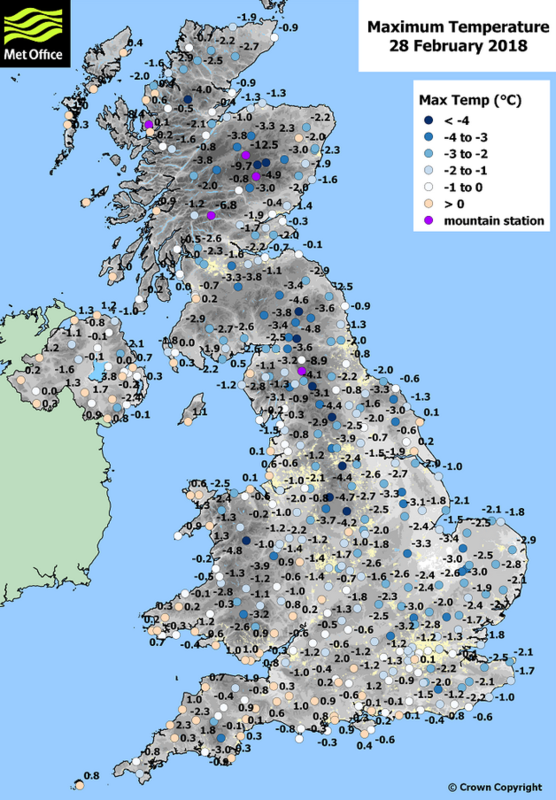 precipitation between 5pm and 11pm) (weatheronline.co.uk). Pic. 37 Thin snow patches in Longstanton, 1.12.2017 7.45am. Pic. 38, 39 Snow cover on Corrie Road in Cambridge, 10.12.2017. Pic. 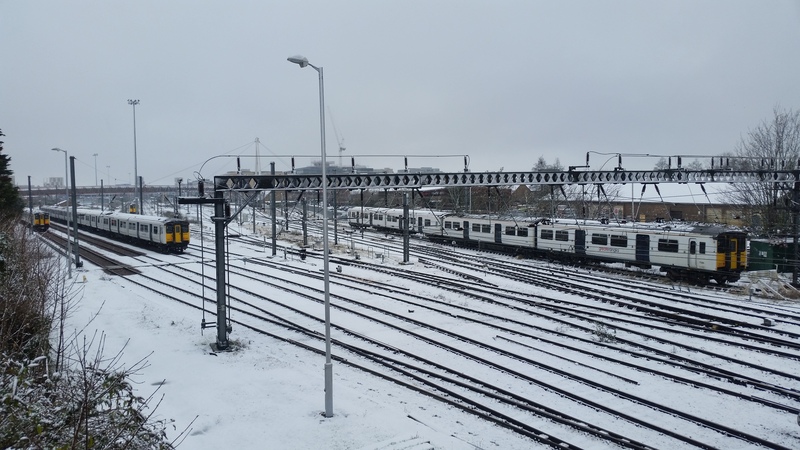 39 Railway in Cambridge hit by snow, 10.12.2017. Pic. 40 Melting snow in Petersfield Play Area in central Cambridge, 10.12.2017. Pic. 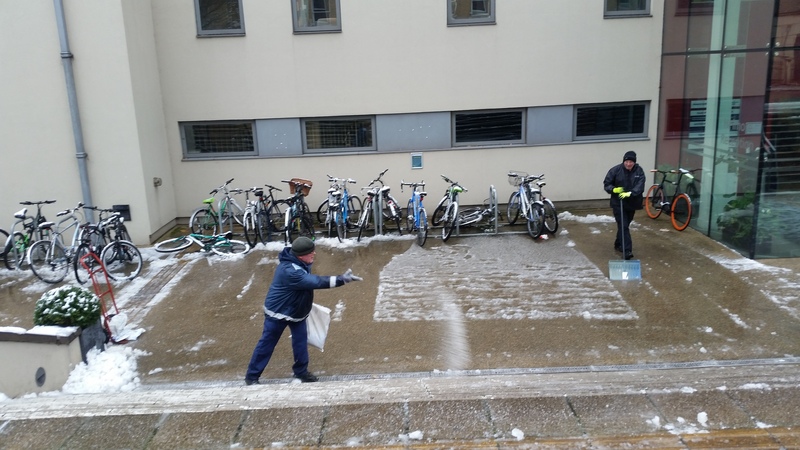 41 Clearing of snow the Anglia Ruskin University frontyard, 10.12.2017. Pic. 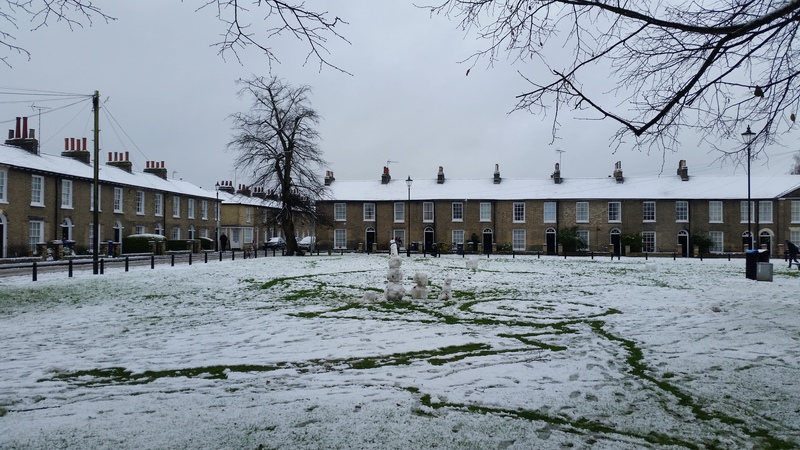 42 Snow in New Square Park in Central Cambridge, 10.12.2017. Pic. 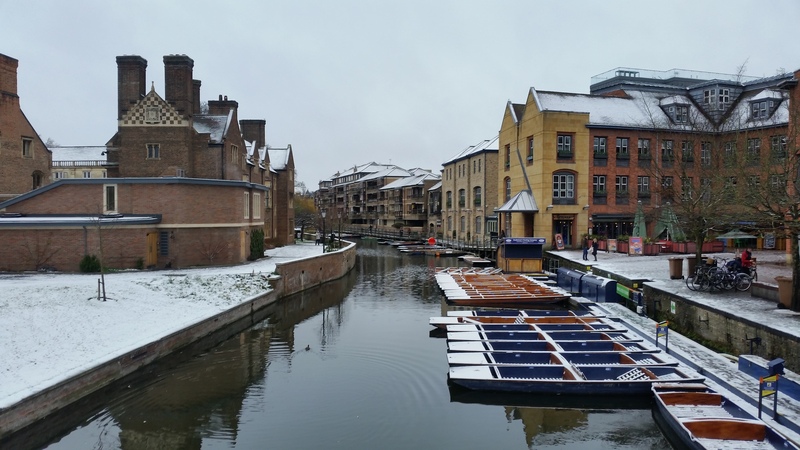 43 River Cam in real winter scenery, 10.12.2017. Pic. 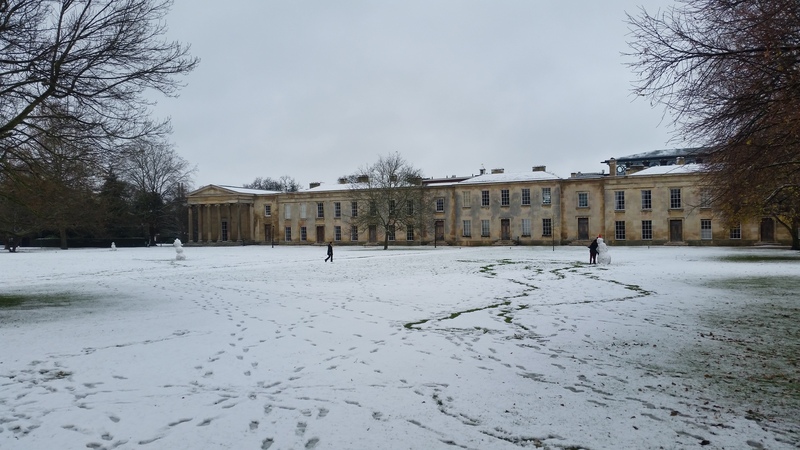 44 The Downing College in snow conditions, 10.12.2017. 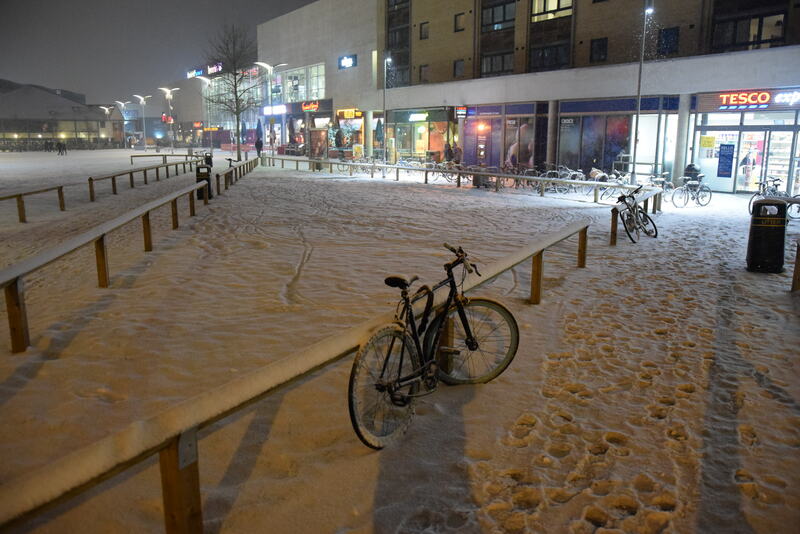 I can say, that Cambridge in snow conditions looks unusual. 1. Holton J.R., Hakim G.,J, 2014, An Introduction to Dynamic Meteorology, Elsevier Science, Amsterdam, ISBN 0-12-354015-1. 2. Rahmstorf S., et.all., 2015, Exceptional twentieth century slow down in Atlantic Ocean overturning circulation, (in:) Nature Climate Change, vol. 5, p475-480. 9. 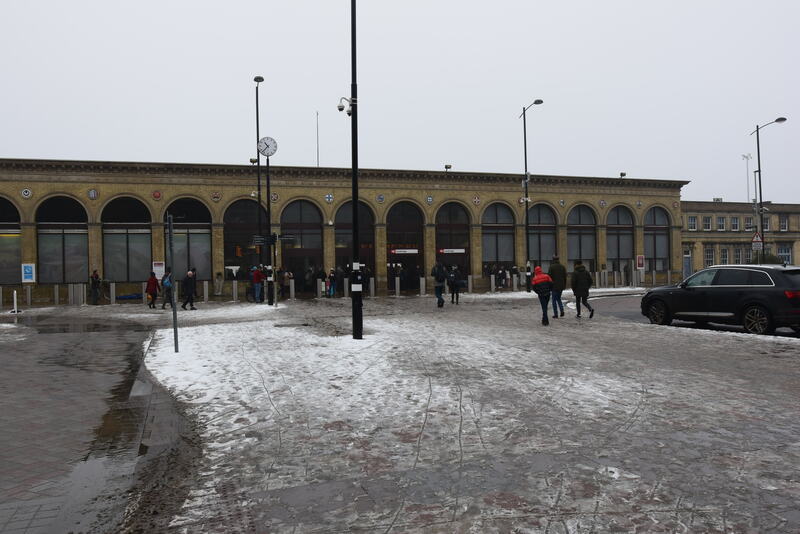 Metro: What caused the beast from the east?